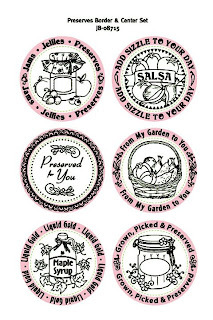 Preserves Set $11.95 plus shipping. 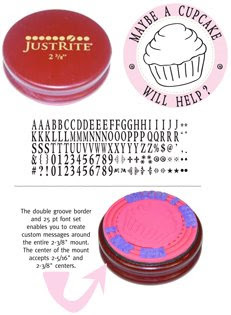 2-3/8" Wood Mount comes with a BONUS 25pt font set (Times New Roman) AND a "teaser" Cupcake Center Double border enables use of 25pt font to make word borders! 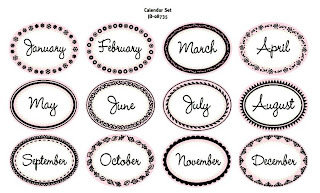 Calendar Borders & Centers - $13.95 plus shipping. 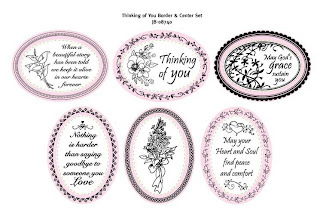 This set uses an Oval 1 3/4" x 2 5/16" (not included) shown below. Thinking of you. $14.95 plus shipping. for $10.00. (Reg. $19.95) See it below! JustRite is out of these right now and so am I.
JustRite is out of these at this time and so am I. If you have any questions on how to use these products, please e-mail me.